As you can probably see, my site is all messed up… it got hacked this week. I’m attempting to restore it from backups, but this is proving more challenging than I would have hoped for various reasons I won’t bore you with. Below is a sketch I made of the wonderful Roe Family Singers setting the woods on fire at the 331 Club earlier tonight… boy, do they make some beautiful music. They play there every Monday to the most unbelievably enthusiastic Monday night crowd you are ever likely to see. 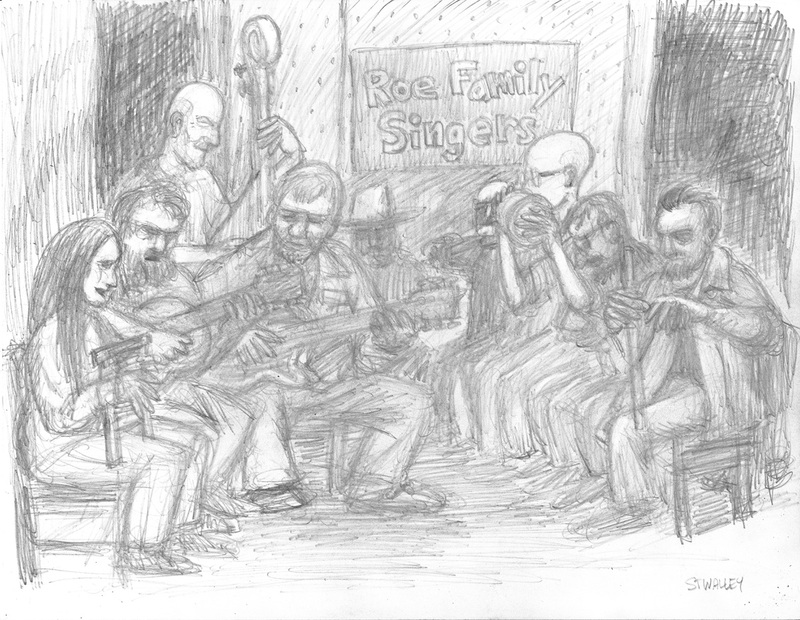 Two of the members of the band, bandleader Quillan Roe and Adam Wirtzfeld on the saw, are also excellent local cartoonists. I can’t recommend checking their show out highly enough. I also posted the image on Ken Avidor‘s fantastic group sketch blog, Urban Sketchers Twin Cities, which he was nice enough to invite me to participate in. There are lots of wonderful sketches of the region there to check out. I have a table at the Twin Cities Book Festival this coming weekend. I will have pretty much everything I currently have in print there for perusal. I’m always delighted to draw something in copies of my Soapy the Chicken book with purchase, fyi… just ask if you’re interested. The first one is The Dead Living, a horror story I did that will also be in this month’s issue of Zander Cannon and Kevin Cannon’s incredible digital anthology Double Barrel, coming out this Wednesday from Top Shelf. If you haven’t checked out the other issues of Double Barrel, you really, really should… and I would do it before you pick up the one my comic is in, as the brothers Cannon are doing some extremely engaging serials that you will want to start at the beginning (a sequel to Kevin’s brilliant Far Arden called Crater XV, and Zander’s paranormal pulp opera, Heck among many other wonders). Double Barrel is the first digital comic I’ve purchased, and it is one hell of a deal… many of the issues have over 100 pages of some of the best comics around for a buck (the most recent two issues are $2, but back issues go down to $1. If you are like me, once you start, you won’t be able to wait for them to drop in price). Anyhow, getting back to The Dead Living… I’ve never done a horror comic before, so it seemed like an interesting challenge to attempt. Horror and humor seem like two of the hardest things to pull off well in comics. I went off of Steve Bissette’s advice/requirement to contributors to his wonderful horror anthology of the 80′s and 90′s, Taboo… I tried to draw something that I found genuinely frightening. So, if I succeeded, hopefully you will be in for an unpleasant read. The other new mini-comic is called Freaky Tiki. 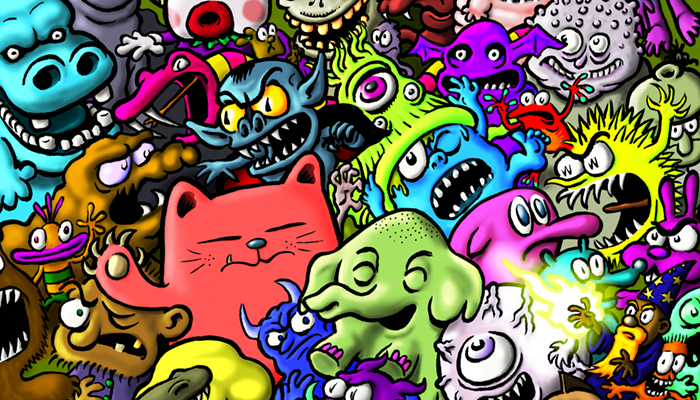 It is a collection of drawings of strange and obscure minor island deities that perhaps exist. I made it for inclusion in the upcoming Lutefisk Sushi Volume E show that the Cartoonist Conspiracy is putting together with our friends at Altered Esthetics Gallery. It is our fifth Lutefisk Sushi hand-silkscreened, limited-edition box set of Minnesota mini-comics (the first was in 2004). So, if you plan to come to the opening for that on November 2nd and buy a box, you will not want to purchase this mini from me… you’ll get one included in the box. Note that, of much greater interest than me at the Book Festival, noted genius Chris Ware will be there, and he will be giving a presentation on his incredible new box of books, Building Stories, at 12:30 in the Taxi Room. Please note that if you have been waiting for updates to Monkey’s Paw, my ongoing webcomic collaboration with Ben Zmith… they will, unfortunately, be slowing down. They will continue, but we can no longer maintain the every Friday schedule. Ben and I were drawing them on our lunch breaks every day, and, alas, Ben got a new gig so now we can’t draw together as frequently. That said, we did every Friday for something like a year and a half… which is a pretty damn good uninterrupted run of free comics, I think. Anyhow, while you wait for updates, you can always check out the archive here. Soapy the Chicken remains in hibernation, but will be returning again one of these days. 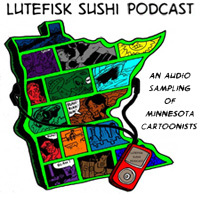 My good friend Danno Klonowski recently interviewed me for his delightful Lutefisk Sushi podcast (which features regular interviews with Minnesota cartoonists, updated every Thursday). You can listen to it here. If you missed the BIG FUNNY deadline, we have an extension going until Friday. 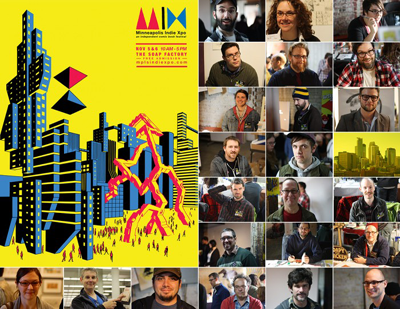 We have a lot of incredible submissions… it is going to be pretty damn amazing, I think. So, if you want to submit, you still can… but you better hurry! Read more here. 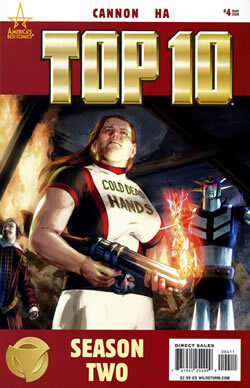 My friend Zander Cannon at Big Time Attic has been authoring a wonderful run on Top Ten, a series he was a co-creator on with Alan Moore and Gene Ha. Unfortunately, it is looking possible that DC Comics is going to cancel the book after it’s first 4-issue arc… and Zander has a second 4-issue arc written. To say that Alan Moore is a tough act to follow is putting it mildly… Zander has done a wonderful job taking the book in new directions and making it his own, while maintaining the integrity and voices of the characters. Gene Ha’s art is beautiful, as you would expect if you are familiar with his work. The Moore issues were excellent… and these issues are just as good. 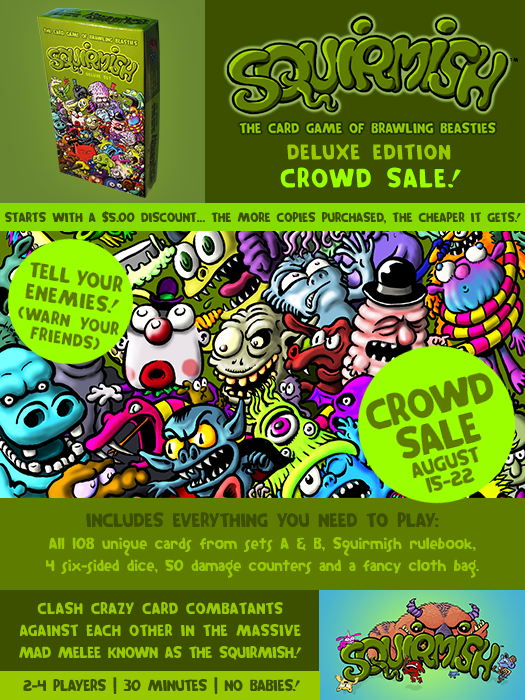 You don’t want to miss it… and if you already read it, you’ll want to contact DC to support it! A drawing from a Cartoonist Conspiracy jam that my friend Ken Avidor and I worked on was in this week’s issue of the City Pages… you can see it above. It is a satire on Dan Lacey’s Faithmouse, and accompanies an article on Mr. Lacey. 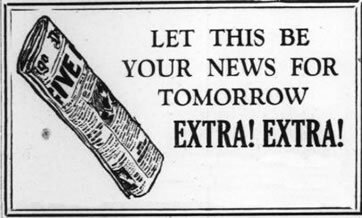 They mis-attributed it to just Ken in the print edition, so they are printing a letter to the editor I wrote about that in the next issue… I’ll link to that when it is up (probably in this post). UPDATE: Here it is the edited version on the City Pages website. 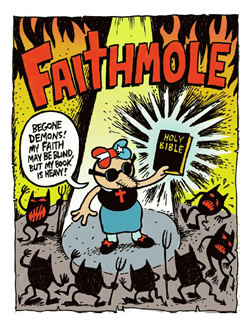 I noticed in the Dan Lacey article in this week’s City Pages that the “Faithmole” illustration was incorrectly attributed to my good friend Ken Avidor, when it was actually part of a Cartoonist Conspiracy (cartoonistconspiracy.com) jam comic that Ken participated in. Ken had passed this information on the the author of the article, but apparently it was forgotten or misplaced, as often happens. I believe Ken and I were the only ones who worked on the page, although I may be wrong… anyone is welcome to draw anywhere in the jam at our twice a month jam comics sessions (first Thursdays at Diamond’s Coffee in NE Minneapolis, third Thursdays at Cosmic Coffee in St. Paul). 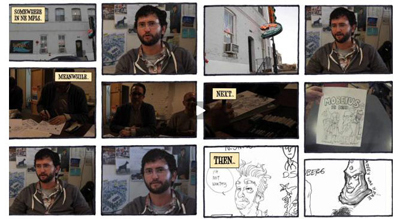 Jam comics, for those who don’t know, are collaborative comics drawn by passing pages around a table and having different cartoonists improvise what happens next on them. Many of the participants signed the last page of that. It is worth noting that The International Cartoonist Conspiracy is not a partisan organization… we would just as gladly skewer Tom Tomorrow* as we would Faithmouse. Faithmouse was one of the topics of the jam… I can’t remember the other topics. We usually pick about three to give the jam some loose cohesion… often by opening up City Pages to a random page and plopping a finger down on a random word (although Faithmouse was simply chosen as a topic because it was funny). While our local membership is largely liberal, we would gladly welcome Mr. Lacey to come draw with us if he was inclined (as we would any cartoonist). I can think of few things I would enjoy reading more than a Faithmouse Vs. Roadkill Bill jam comic drawn by Avidor and Lacey, come to think of it. * As long as I’m writing, I’ll add my voice to the legion… when are you guys gonna bring Tom Tomorrow back? You should have MORE comics, not less! At the pathetically meagre sum most cartoonists get paid for a comic to be published, there can’t be a bigger bang for your buck out there. Comics are the last thing to cut in a budget… not only are they the first thing a lot of people want to read in any paper, but they are so cheap it doesn’t even make a dent! Go read the full review here. 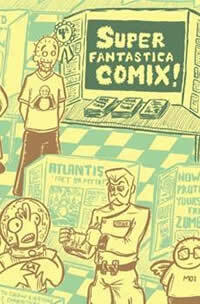 Go read more about Super Fantastica Comics here, and order yourself a copy here! I have work in the Winter 2008 and Summer/Fall 2008 issues as well, if you’re interested. Dammit! I’m too late to let you all know about Free Comic Book Day… it was Saturday. I missed it too (other than emailing for a free copy of the wonderful mag Hogan’s Alley at the last possible hour, which was offering them for the day). I think I’m gonna cry. It’s like missing Christmas. Let’s go next year, yes? Get draw’rin already! I can’t wait to see everything! You still have three more days to go vote on my Beecorn t-shirt design, if you’re inclined to do me the favor… thanks much to those of you who have already voted, and also who have passed it on to your friends! It has been very gratifying getting all the comments over at Threadless… I’ll definitely be doing this again regardless of whether they make my design into a t-shirt or not. MICROCON is this Sunday! should be a great time! I am unfortunately going to miss it this year, as I will be in Toronto attending Flash in the Can. 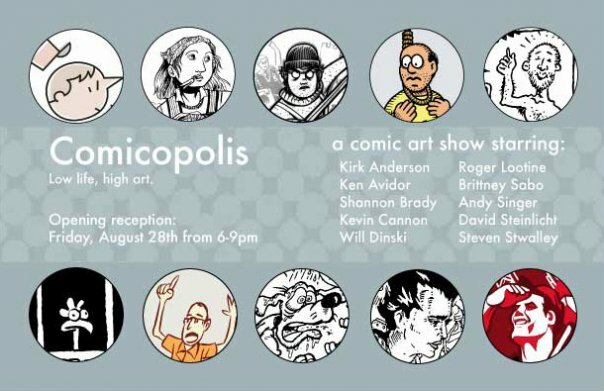 You won’t want to miss it if you are in the Twin Cities… it is always a great time thanks to the wonderful Midwest Comic Book Association.